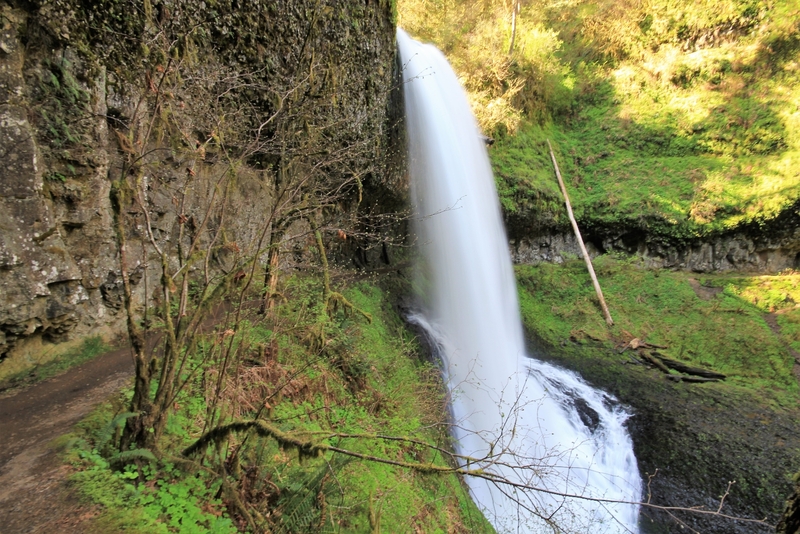 Bucket list hikes don’t get any better than the Trail of Ten Falls at Silver Falls State Park. 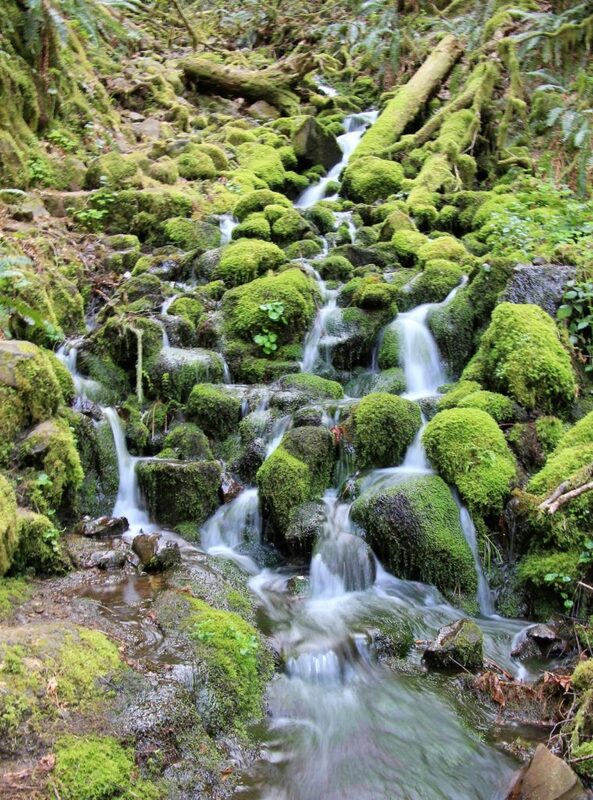 This trail in Oregon’s largest state park (9,057 acres) takes you to TEN beautiful waterfalls, four of which you can walk behind. 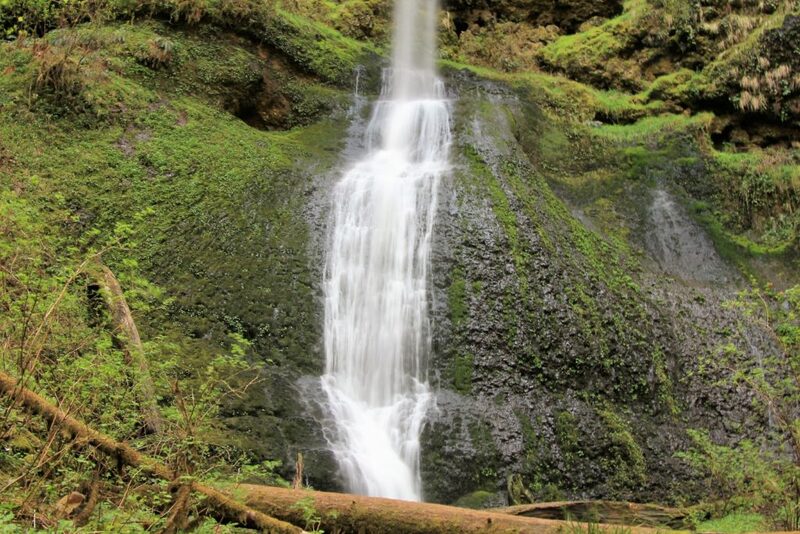 I had been told that this loop hike is even more beautiful than the Eagle Creek Trail in the Columbia River Gorge. 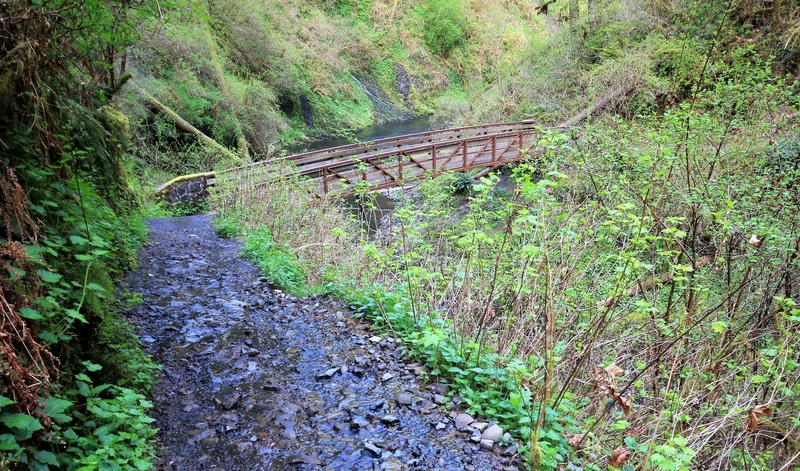 Given the stunning beauty of Eagle Creek (at least prior to the 2017 fire), this seemed hard to believe and I couldn’t wait to see if it was true. After dreaming of this trail for many years, we were finally able to check this one off the list during our April 2018 Oregon vacation. South Falls Day-use Area has the largest parking area and offers easy access to the historic South Falls Lodge and massive South Falls, the park’s most visited falls. North Falls offers a smaller parking area that I’m guessing fills quickly on weekends. 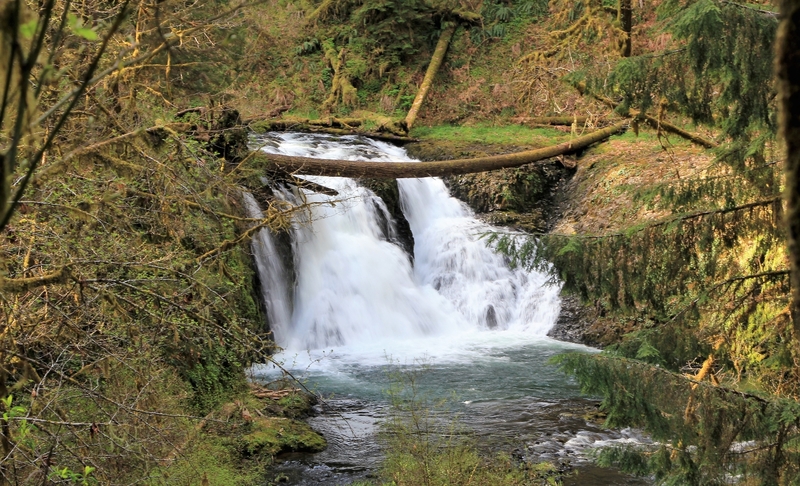 Smaller lots at Maple Ridge and Winter Falls also offer good access to the falls, but I recommend leaving those few spots open for those who cannot hike the whole loop or those who prefer to visit just one or two falls. Numerous trail options are available at Silver. I highly recommend the full Trail of Ten Falls which loops together the Canyon and Rim trails, for a 7 mile loop. 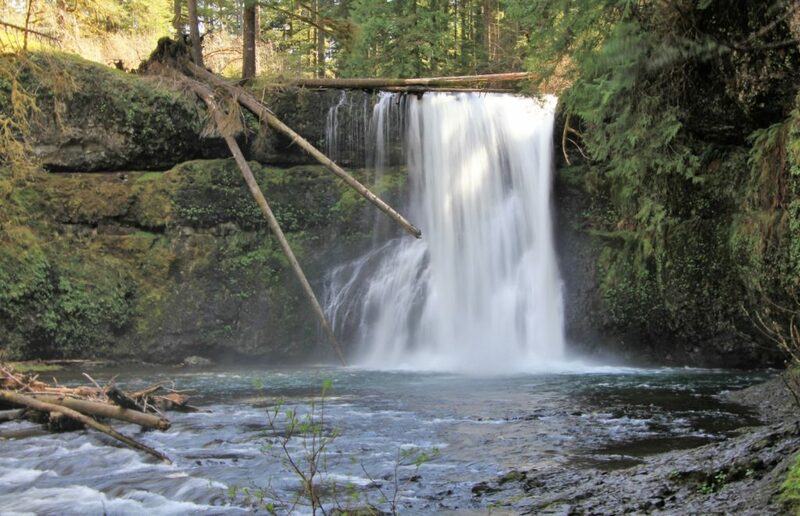 If this is within your range, consider adding on the short side trails to Double Falls, Upper North Falls, and Winter Falls, which is the route I’ll be describing here. 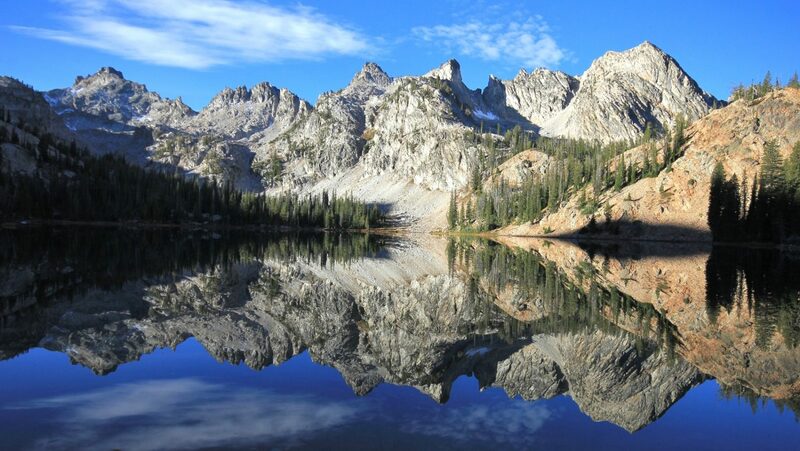 For those who cannot or do not wish to hike that far, numerous shorter options are available. 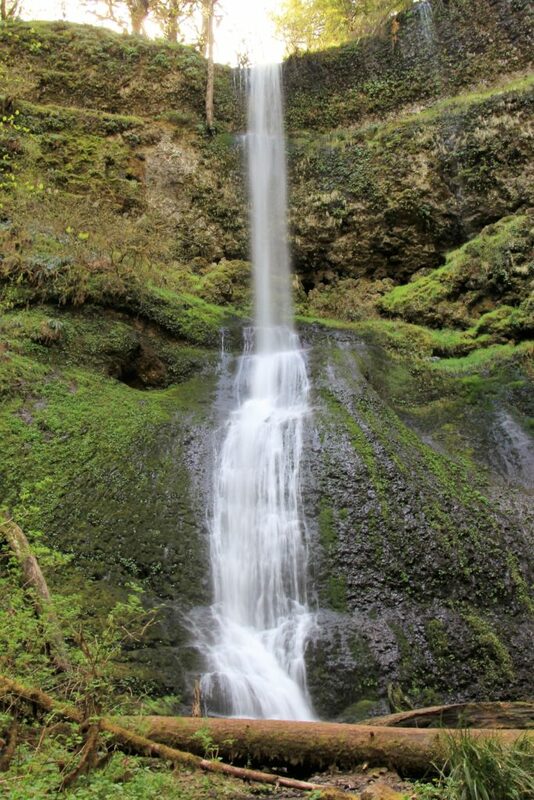 Check out this excellent trail map that includes a photo and height of each of the ten falls. Be advised that while the trails are exceptionally well maintained, they do include elevation changes over sections with mud, wet rocks, and rock stairs. Wear shoes with good support and traction and be sure to carefully watch your footing. We arrived at the South Falls Day-use Area (elevation 1,435′) just before opening on a beautiful late April day. While waiting for the park ranger to unlock the gate, we enjoyed a second cup of coffee and watched a few deer grazing in the lush forest. Despite visiting on a week day, we anticipated the park would be busy given the beautiful weather. 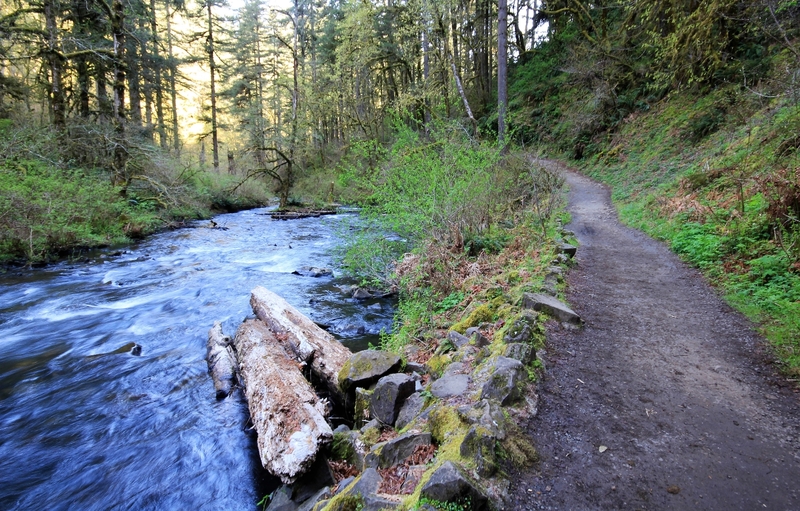 Silver is one of Oregon’s most popular state parks with over 1.3 million day-use visitors per year. 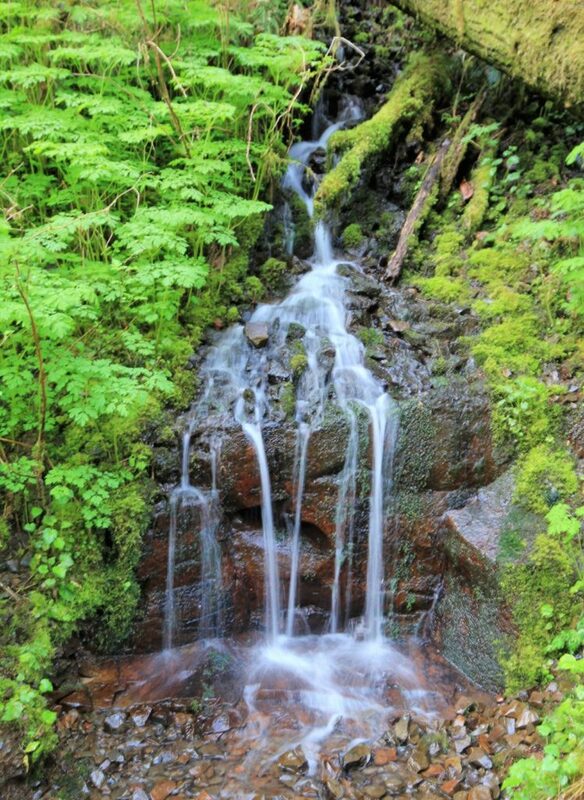 Depression Era Jewel – as you walk through the South Falls Day Use Area and walk the Trail of Ten Falls, look for the remarkable work of the men of the Civilian Conservation Corps, or CCC, and the skilled details added by the Works Projects Administration, or WPA. 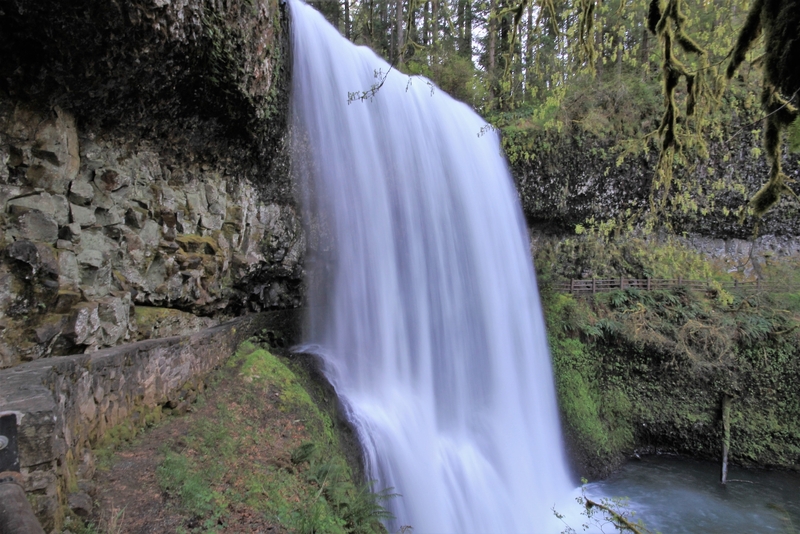 CCC and WPA workers built the infrastructure of Silver Falls State Park between 1935 and 1942. Imagine the backbreaking work to create the Trail of Ten Falls! Their 88 projects also included rock walls, buildings, bridges, stairs, and picnic shelters and of course the South Falls Lodge. The work of the CCC boys was overseen by the National Park Service; the Army took care of them after hours. They lived in barracks on the work site and sent home an allotment of $25 per month, leaving them with $5 per month. 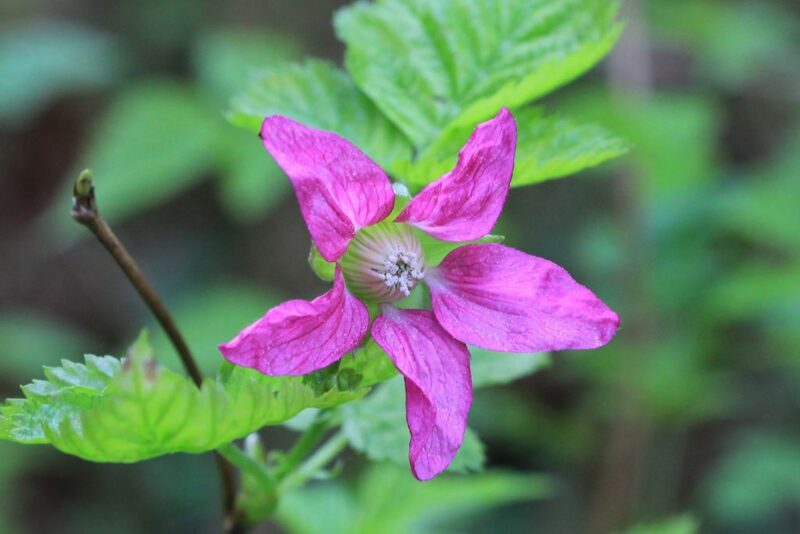 The aim of Silver Creek was to restore a former area of outstanding natural beauty to as close to its original state as possible, then use the land as an outdoor education center for youth programs. 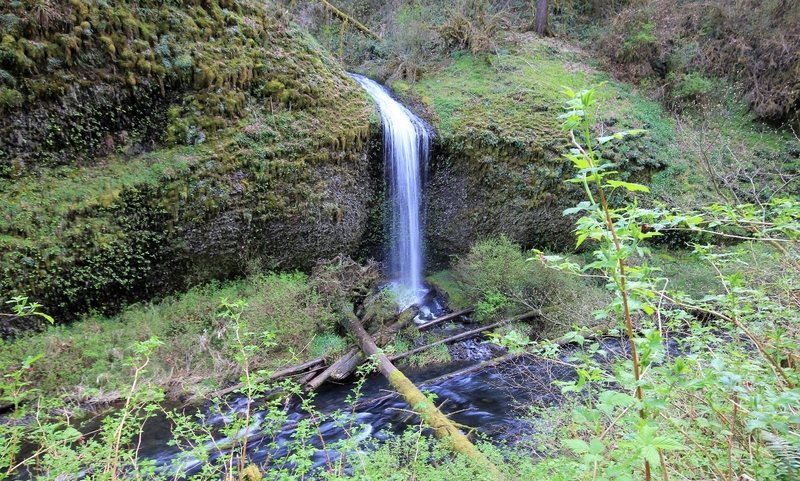 Silver Creek Falls State Park (established 1933) and RDA were united as one park in 1948. My Grandpa Don was a proud “CCC boy”, so I always have a special interest in any site that demonstrates their handy work. What a great program for depression-era families and for the natural wonders of our nation. How fortunate we are to still be enjoying their projects some 80 years later. 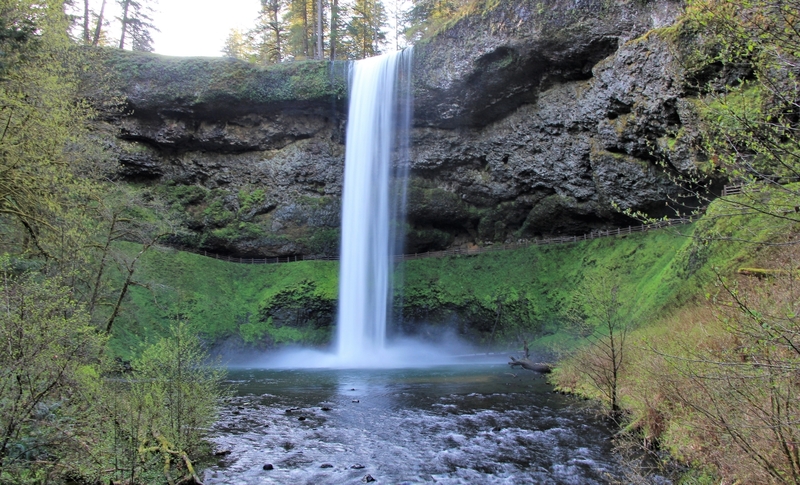 From the lodge, it was a short walk to a viewpoint above South Falls which drops 177 feet. We also found a signed side trail that took us to French Falls. French wasn’t very impressive, but it did add to the total number of falls we’d see. Back on the main trial, we had a choice to make. I wasn’t exactly sure which trail to take so we split to the right. To the left would have taken us behind South Falls; whereas the right dropped us to the bottom of the falls. That was o.k.—we’d walk behind multiple other falls soon enough. 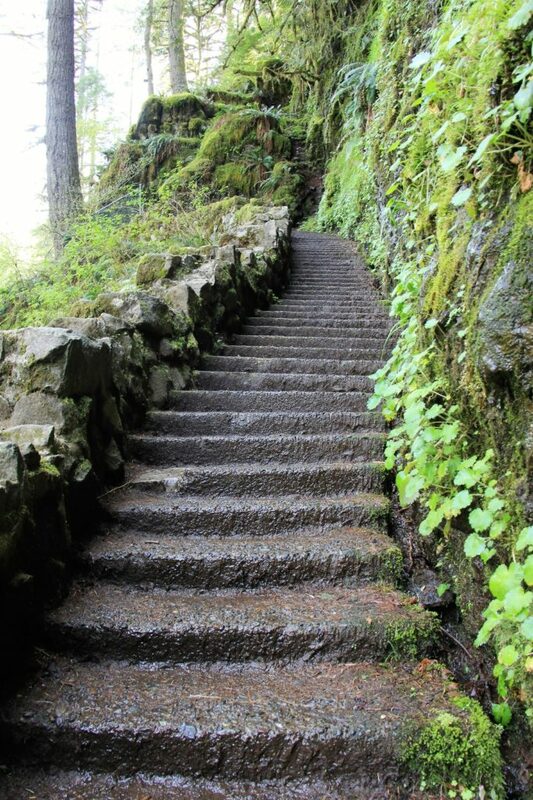 From South Falls, we continued about 0.75 miles to a set of stone stairs where we made a short descent. Here we could heard the roar of another major falls. 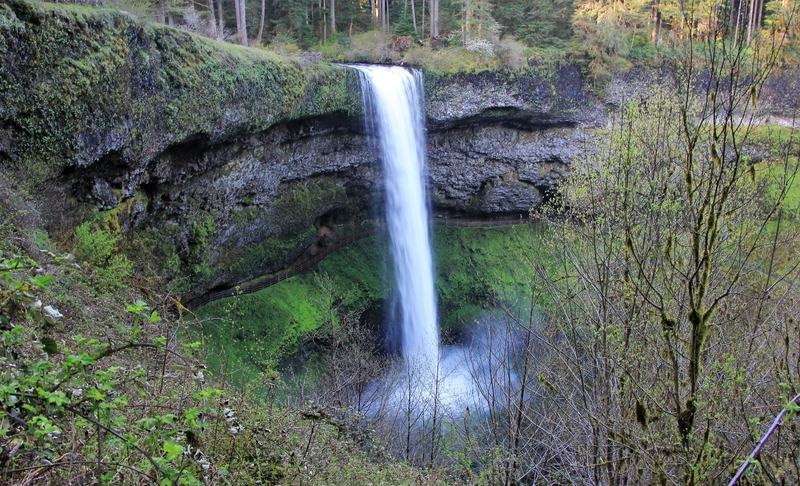 We found ourselves looking down at Lower South Falls which has a 93 foot drop. We carefully negotiated the wet trail as it dropped us down and then behind the deafening falls. There was a lot of water coming over this one and you could feel its force and raw power as it shook the ground. It is a unique experience to walk behind waterfalls. Just the previous day, we’d been treated to great views from behind nearby Shellburg Falls. How these big caves can form behind such massive falls is an interesting lesson in geology and is explained in park literature, this land was once part of the Oregon Coast, but volcanoes, basalt lava flows and falling ash changed the landscape to what you see today. 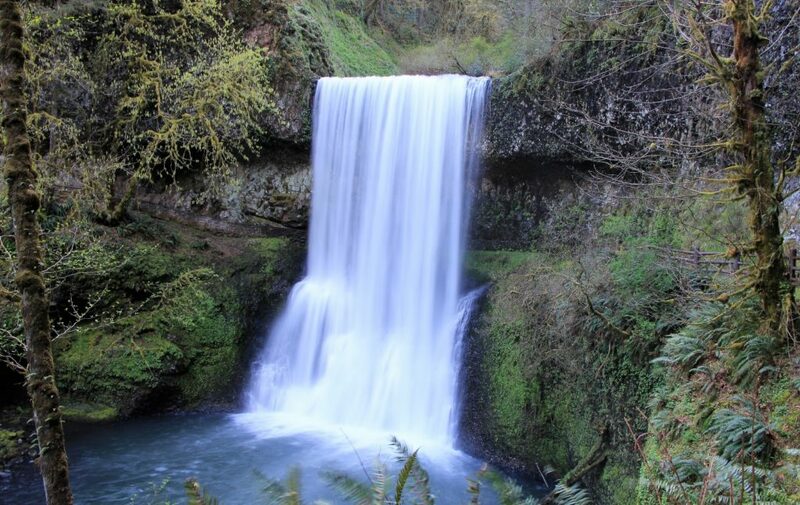 Waterfalls tumble over thick basalt that rests on softer, older rock. 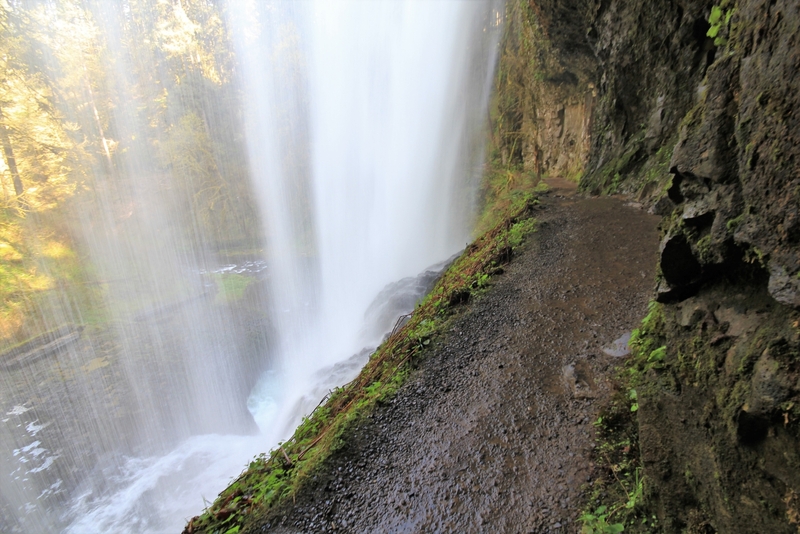 The softer layers beneath the basalt eroded over time and created natural pathways behind some of the falls. 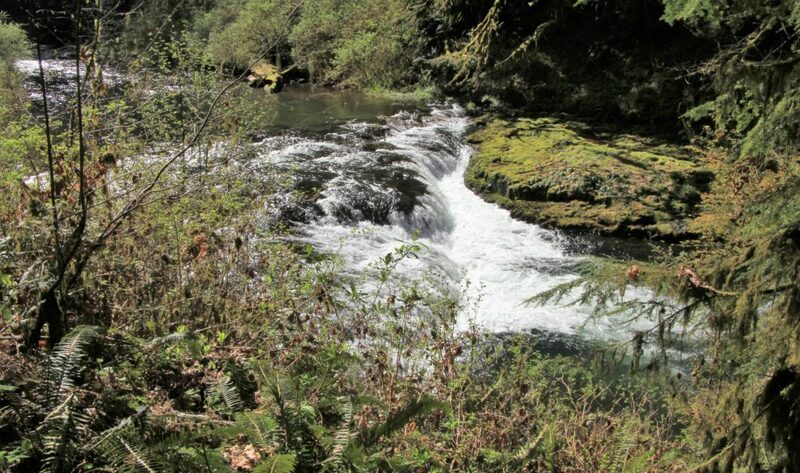 From there it was 1.25 peaceful miles and an easy stroll along the North Fork of Silver Creek to Lower North Falls. This was a pleasant stretch where we enjoyed lush green ferns, moss covered trees, and occasional spring wildflower in bloom. We also passed numerous unnamed, seasonal falls before crossing the North Fork on a sturdy footbridge in a narrow part of the canyon. Lower North Falls drops 30 feet and seemed wider than it was tall. Just past Lower North, and just before crossing a small foot bridge, we took a short side trail up to Double Falls. Double is a lovely falls with a 178’ drop. I thought this was an especially beautiful falls and I highly recommend making the short detour. We backtracked to the main trail and soon passed Drake Falls (27’) and then Middle North Falls (106’) in short succession. Middle North was another impressive falls. A dead end spur trail takes you behind the falls. At 0.4 miles from the split to Double Falls, we came to a trail junction. 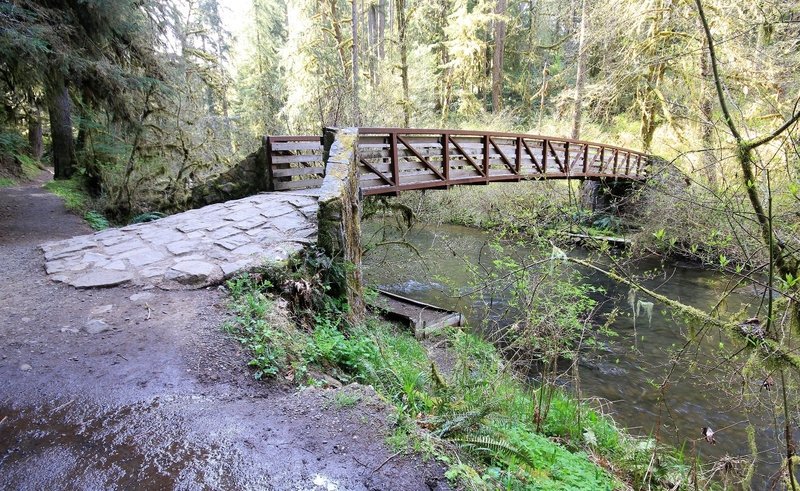 To the right, a bridge crossed North Fork of Silver Creek and climbed hikers up the Winter Trail. We took a short snack break before continuing straight along the Canyon Trail. It was in this area that we started seeing sporadic hikers, but the trail remained very quiet until we reached the North Falls parking lot. Continuing on 0.3 miles from the Winter Trail junction, we reached Twin Falls. Twin was only 31’ tall, but had a lovely shape. Past Twin, it was a mile before we reached the next falls. This was a beautiful stretch above the creek as the sun finally started reaching the canyon bottom, casting a beautiful light through the moss covered trees. Eventually, we heard the characteristic roar and soon enough we were in sight of massive North Falls (136’). Once again, the trail took us behind a rushing torrent of water. From North, we climbed a set of impressive stone steps to a viewpoint down onto the top of North Falls. Just past the viewpoint, we reached another trail junction. We turned left and hiked a short distance to the North Falls parking area. Here we used the facilities and took a short snack break on a nice bench. The small parking lot was quickly filling up with people as it was now almost 11:00 on a beautiful spring day. I can only imagine how packed this place gets on a weekend. From the parking area, we made the short 0.3 mile hike up a spur trail to Upper North Falls which has a lovely drop of 65’. On the return hike, we talked with a couple women who live in the area. They hike the trail often and confirmed that while the falls are beautiful any season, they were especially impressive with the peak spring run-off. Back at the North Falls parking area, we set off on the Rim Trail. As the name implies, we were high above the canyon following along the rim. We were just below the park road and could occasionally hear a passing vehicle, but this was still a pleasant enough jaunt through the forest. We covered ground quickly as the trail gently rolled and the tread was good dirt. At just over a mile from the North Falls parking area, we came to a junction with the Winter Falls trail. We were starting to get a little tired and I wasn’t exactly sure how much elevation we’d lose (and have to regain) or how far we’d have to hike to see Winter Falls, but we’d taken every spur trail to a waterfall so far and I wasn’t about to skip this one! We descended into the canyon and soon found ourselves at a beautiful and particularly photogenic falls with a drop of 134 feet. It was well worth the climb out and the estimated half mile it added to our daily total. Back on the main trail, we continued another 1.2 miles along the Rim Trail to the South Falls parking area. The loop trail, including all side trails, took us 9.5 miles past ten impressive waterfalls and countless smaller, seasonal falls. 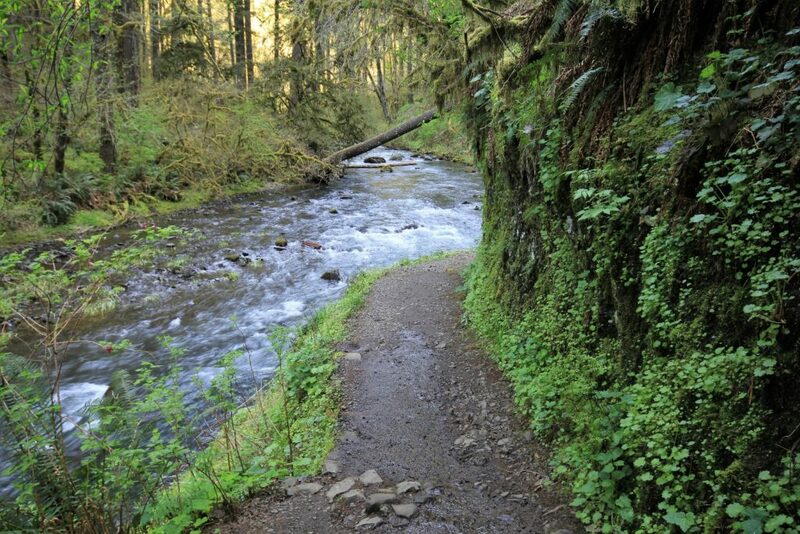 Was the trail better than Eagle Creek? While it is hard to choose between two such spectacular trails, I would indeed give Silver the edge. I encourage you to hike both and decide for yourself! 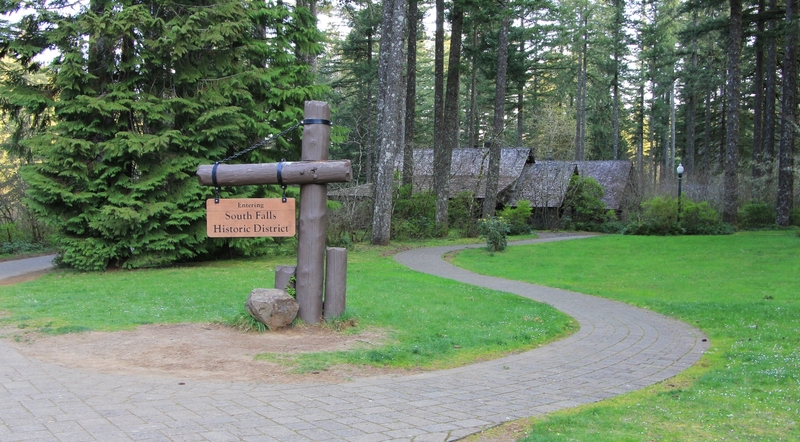 Park at the South Falls Day-use Area and take the short walk to the historic lodge and then to the viewpoint above South Falls. Back near the parking lot, enjoy a nice picnic lunch. For those who are able to negotiate the trail, but don’t have time for the full loop, I’d recommend parking at the North Falls parking area and doing the smaller loop down the Canyon Trail up the Winter Trail and returning via the Rim Trail. 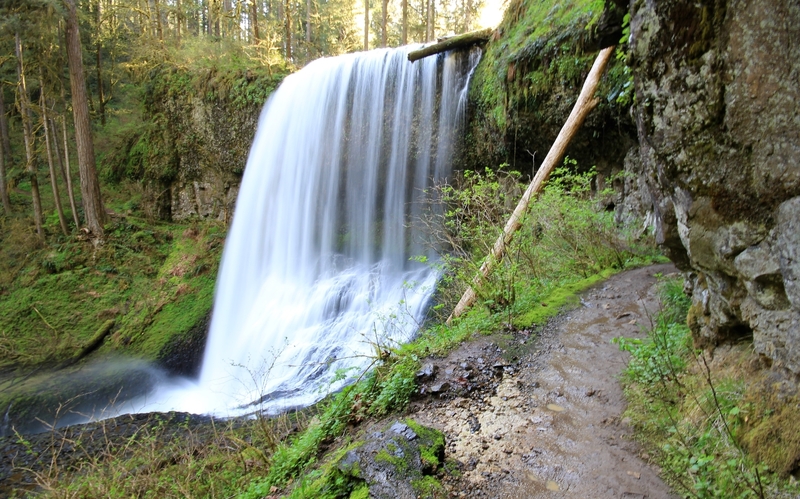 Be sure to include the side trail to Upper North Falls at the start or end of your hike. 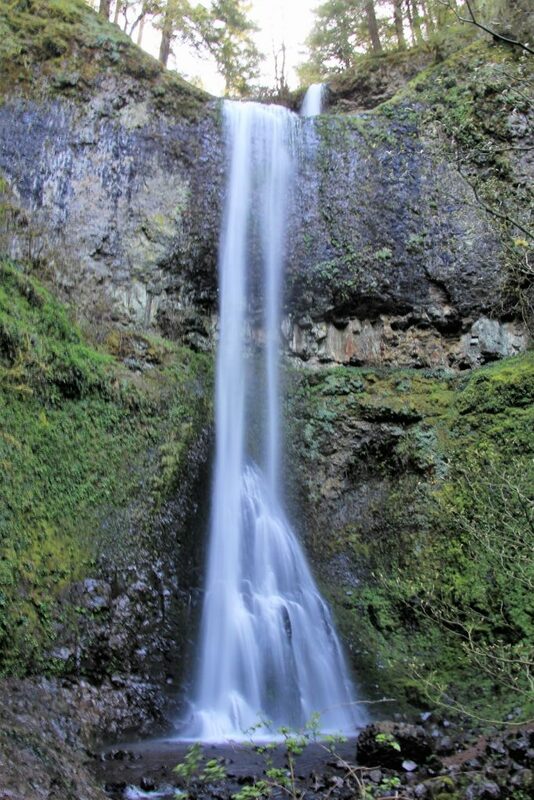 Also a must, hike the extra stretch of Canyon Trail to Middle North, Drake, Lower North, and Double Falls. 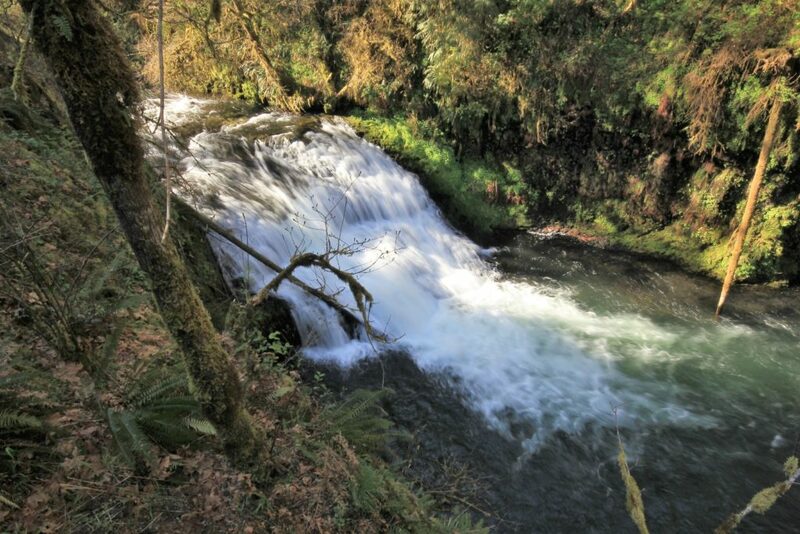 This loop showcases eight of the ten falls including two that you can walk behind—not bad for five miles! 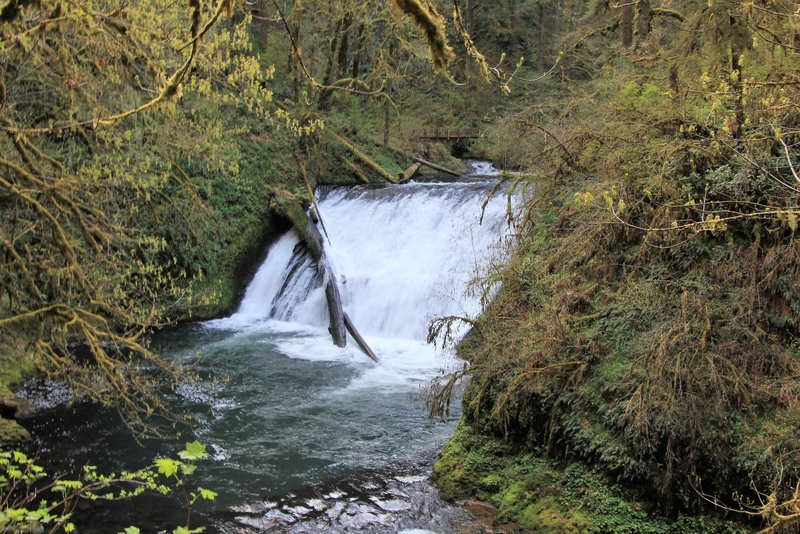 Directions to Silver Falls State Park: from Salem, Oregon, drive 10 miles east on North Santiam Highway 22. 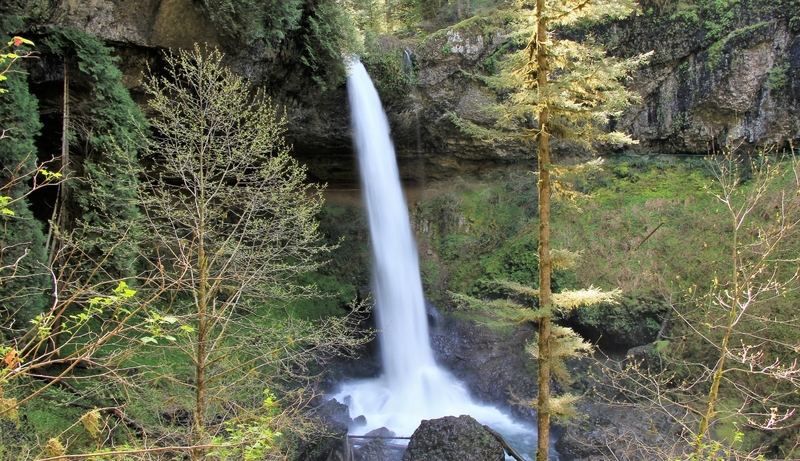 Turn north at a sign for Silver Falls Park and follow highway 214 16 miles to a sign pointing left into the South Falls Day-use Area. Follow signs for the South Falls Lodge. The trail to South Falls starts just past the lodge and is well marked. 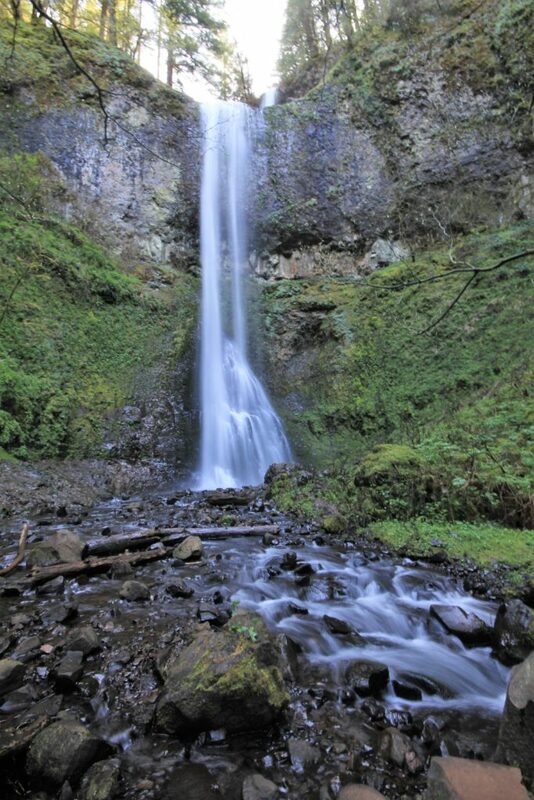 A Oregon State Park Pass or $5 day use fee is required. Restrooms are located at both the South Falls and North Falls parking areas. Beautiful job of photographing and you picked a good time to hit this with the great water flow and the trees haven’t fully leafed out so you get the best views . I live so close that I can hit this one in all seasons . This fall was one of the better color ones in a long time . Three years ago did it in the winter and everything was all iced up big time . Needed micro spikes to hike the whole trip . I always park at the south end and hike the rim trail to the other end and then down the canyon trail . Much easier that way because it is mostly down hill all the way then , except right at the end and then you pull the hill out . As much as I dislike the snow after all these winters on the Palouse, I would love to see Silver in the winter. We visited Palouse Falls one time after days of single digit temperatures and it was quite spectacular.